What a treat it is to taste one of Alsace’s great all time wines! In fact, this is an especially rare bottling of Clos Ste. Hune in that it only came to be thanks to the particular nature of the 1989 vintage in Alsace, when Botrytis cinerea was rampant. By the time the Clos was ready to be harvested, noble rot was everywhere, so Trimbach opted to make two different Clos Ste. 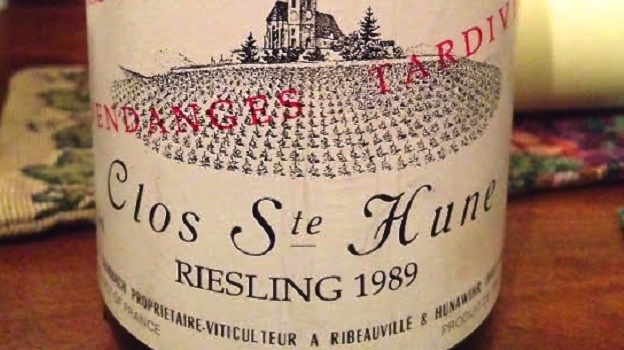 Hune VTs in 1989: the “regular” (but I shudder in referring to any Clos Ste. Hune as “just” regular) and the VT Hors Choix, made from the oldest vines harvested two weeks later than the “regular” Clos Ste. Hune VT. As far as I can tell, this is my second last half bottle remaining, and it was in better shape than the most recent one I tasted (interestingly, same cellar, same provenance): with bright golden-tinged straw green color, along with aromas and flavors of tangerine liqueur, candied orange peel, ripe lime, botanical herbs and some petrol, the 1989 is characterized by breathtaking purity and precision. A great wine! Now I just have to figure out the right occasion in which to open up my last half bottle! 98/Drinking window: 2015-2025. Well-stored bottles will last even longer.